If you'd like to use the Default Out of Stock message, check the radio button next to Show Default Out-of-Stock/Backorder Messages. The default message reads "Item is out of stock, but can be purchased for back order." If you'd like to use a custom message, check the radio button next to Show Custom Out-of-Stock/Backorder Message and enter your custom message in the text box below. Note: Custom Backorder messages will not display for Buy-Me Buttons, this feature is only for the Internet Store. 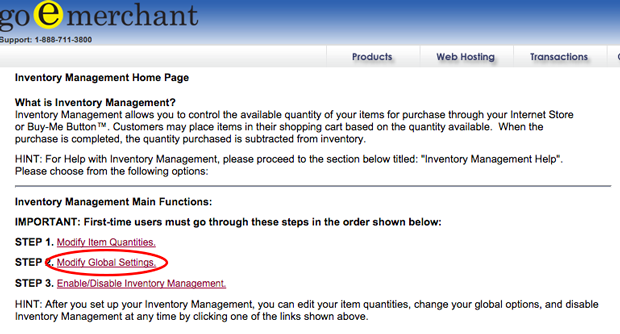 Using the dropdown menu, select the Low Inventory Warning Threshold (Quantity). When the quantity of that item drops to the selected number or lower, you will receive an email notifying you of its low inventory. At the top right, click the GO LIVE! button. This will save your changes.